Last week, the nation heard about 18-year-old Chad Thomas, a senior at Booker T. Washington Senior High in Miami, who received 150 scholarship offers for his prowess on the football field and ability to play nine instruments. 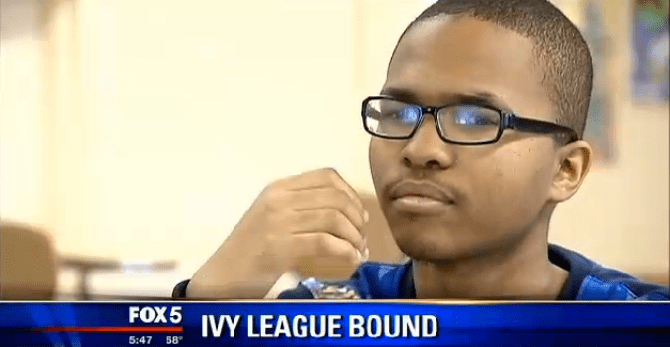 This week brings Avery Coffey, a senior at Benjamin Banneker Academic High School in Washington, D.C., who applied to and was accepted at five Ivy League universities, including Harvard, Princeton, Yale, Brown and the University of Pennsylvania, according to Fox News. Four have already extended very generous financial aid packages, while Harvard is still crunching numbers to formulate its offer, the article says. Coffey, who boasts a 4.3 grade-point average, grew up in a single-parent household in D.C.’s Ward 8, one of the poorest areas in the city. His mom works as a technician at Children’s Hospital, the report says. “You can go anywhere you want to, pursue any career that you want to, and you shouldn’t let anybody hinder you from trying to reach your goals,” he told Fox News, giving advice to younger students. Coffey, who plans to major in finance, hasn’t yet made up his mind about where he plans to enroll. But he’s giving close consideration to the University of Pennsylvania and Harvard, the report says. Banneker is known for its strict rules and policies. None of its 439 students is allowed to bring cell phones into the building. Nor are they allowed to access their lockers during the school day, a measure designed to discourage loitering in the halls.